Preparing for medical school requires years of challenging courses, epic-length admission tests and amazing stamina given that it's only the beginning of the journey. Put your hard work to work for you. Whether through superior academic achievement, the ability to balance school work with community service, or a commitment to serving your country, Trinity recognizes our incoming students' efforts with merit-based scholarships, grants and awards. Unless otherwise noted, the following scholarships and grants are exclusively available to incoming first-term MD students. Selected by the scholarship committee and awarded to a select group of applicants who have demonstrated high academic achievements in GPA and MCAT exam testing. 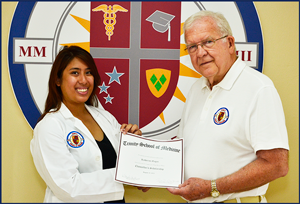 Award will reduce the tuition by $2,000 each term of the ten-term MD program. To be eligible, accepted students will have an undergraduate GPA of 3.0 or higher and an MCAT score of 502 . Retention requirements – cumulative 3.2 GPA by academic year; first-time pass of USMLE Step 1 exam. 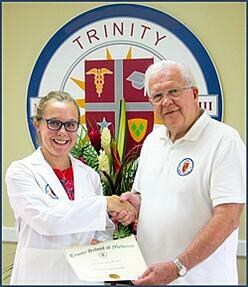 Award will reduce the tuition by $2,500 each term of the ten-term MD program. To be eligible, accepted students will have an undergraduate GPA of 3.0 or higher and an MCAT score of 508. 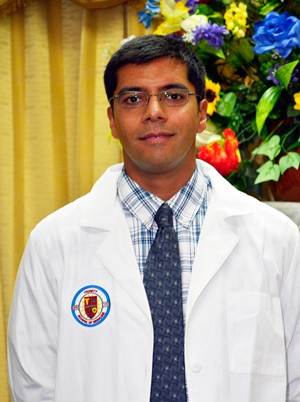 Award will reduce the tuition by $3,000 each term of the ten-term MD program. To be eligible, accepted students will have an undergraduate GPA of 3.5 or higher and an MCAT score of 518. All students who are awarded the Physician’s, Dean’s and President’s Scholarship who have a GPA of 3.2 or higher may be invited to compete for an additional merit scholarship level: The Chancellor’s Scholarship, elevating their current scholarship to an award level of $50,000. One award will be made per academic year. Applicants will complete a written response to a topic determined by the chancellor. The Award recipient will be selected by the scholarship committee. Students must maintain a 3.2 GPA and earn a 230 or higher on their first attempt of the USMLE Step 1 exam. The Vincentian Scholarship is awarded to an eligible student entering the MD program from St. Vincent and the Grenadines. The St. Vincent and the Grenadines Services Commission will receive applications, select finalists and choose the award recipient. The Award for Excellence is a $1000 award to any Trinity SOM student who scores at or above 230 on the USMLE Step 1 exam on the first attempt or who scores at or above 244 on the USMLE Step 2 CK on the first attempt. 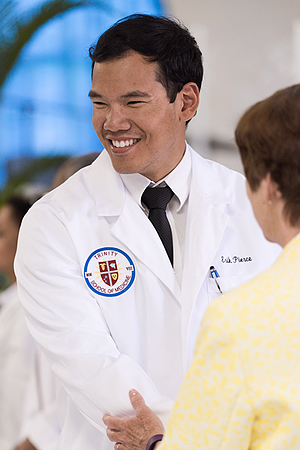 Scholarships are offered to an applicant when they have been offered admission to the MD program and have met the criteria for eligibility as determined by the Scholarship Committee or Admissions Team. All scholarships require recipients to maintain the specified GPA, successfully complete the admission requirements and honor school policy. Selected by the Office of Admissions and awarded to a select group of qualified applicants who have served their country in one of the divisions of the US Armed Forces. This grant will be awarded to a select group of military veterans who have served their country in the Armed Forces on current active duty or with a verified honorable discharge. Recipients must provide official records demonstrating eligibility for this grant. Additional information on utilizing the Post 9/11 GI Bill® Benefits. Selected by the Office of Admissions and awarded to a qualified applicant(s) who has demonstrated leadership in community service at home or abroad. Selected by the Office of Admissions and awarded to a qualified applicant(s) who has a prior background in a health care profession: Nursing, EMT/Paramedic, Physicians Assistant, or Scribe. Eligibility based on citizenship of a Caricom nation and applicable to the MD program only. A grant of $2,500 per term for the ten-term MD program, will be awarded to students who have proof of citizenship of a Caricom nation. Questions about grant or scholarship eligibility? Contact an admissions advisor. 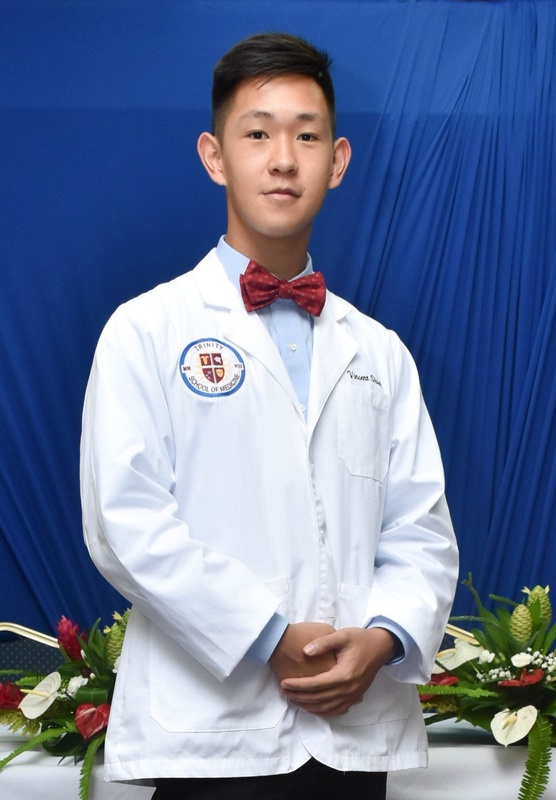 The 2018 recipient of Trinity School of Medicine's merit-based $50,000 Chancellor's Scholarship is University of Chicago graduate Vincent Shieh. Erik Pierce, graduate of Brigham Young University, shakes hands with Dean Adkison after earning Trinity School of Medicine's Chancellor's Scholarship, an award of $50,000. Ryan Seenath, graduate of the University of Toronto, qualified to compete for the 2017 Chancellor's Scholarship and earned the $50,000 merit-based award. Katherine Gagan, graduate of the University of Maryland, College Park, awarded the $50,000 Chancellor's Scholarship, accepted her merit-based award from Dr. Skelton. Kathryn Bakkum, graduate of Loras College, receives congratulations from Trinity Chancellor, Dr. Douglas Skelton after her essay was selected to secure the $50,000 merit-based scholarship.